We're just days away from the launch of AMD's much rumoured Radeon HD 6000 chips. But what can you expect from AMD's second generation of DX11 graphics chips? This close to launch, the rumour mill is approaching critical mass. The most certain information involves the the graphics chip known as Barts. 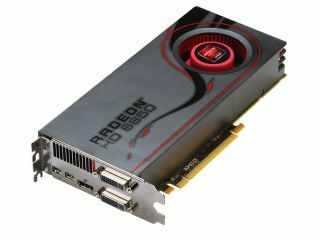 Due to be unveiled later this week, Barts will be the mid-ranger of the new Radeon HD 6000 family. Despite that, it's shaping up to be an extremely powerful chip. The consensus suggests it'll pack 1,120 stream shaders in its most powerful form. That may not sound like a huge boost over AMD's existing mid-ranger, the 800-shader Radeon HD 5700 series. However, with the 6000 series comes an overhaul to AMD's shader architecture. The specifics aren't clear, but it seems that AMD is ditching its current approach involving blocks with four simple and one highly complex shader unit, otherwise known as an ALU units. Instead, each shader block will pack four relatively complex ALUs. Barts is also expected to receive a memory major memory bandwidth upgrade thanks to a new 256-bit memory controller, a first for a mid-ranger AMD GPU. Exactly what impact all this will have on the performance of the new chip isn't known. But Barts is expected to deliver similar performance to AMD's current flagship GPU, the Radeon HD 5870. If true, it will be very tough competition for Nvidia's competing GPU, the GeForce GTX 460. Impressive stuff and perhaps an explanation for an intriguing change in branding that's expected for Barts. Rumour has it, AMD will slap a Radeon HD 6800 badge on Barts GPUs. If true, that will mark a break from AMD's established nomenclature where an "8" in the GPU name denoted a flagship GPU. So, what about the flagship chip in the Radeon HD 6000 series? It currently goes under the codename Cayman but looks likely to sell under the Radeon HD 6900 brand. AMD has managed to keep details of Cayman quite well cloaked. But it very much looks like the top 6970 chip will pack 1,920 shaders. That's a reasonable, if not spectacular improvement over the 1,600 shaders of the existing Radeon HD 5870. But don't forget, that's 1,920 new-style more powerful shaders. With that in mind, it's likely that the 6970 will easily overtake Nvidia's GeForce GTX 480 as the most powerful GPU on the planet. It's also worth remembering that all of the Radeon HD 6000 series will be manufactured using the same 40nm production technology as the existing Radeon HD 5000 family. In other words, AMD hasn't been able to use a smaller production node to pack more transistors and features into the new chips without increasing size, cost and power consumption. These will be big, power hungry and expensive chips. TechRadar will have full coverage of the AMD Radeon HD 6000 launch.at the end of the week.